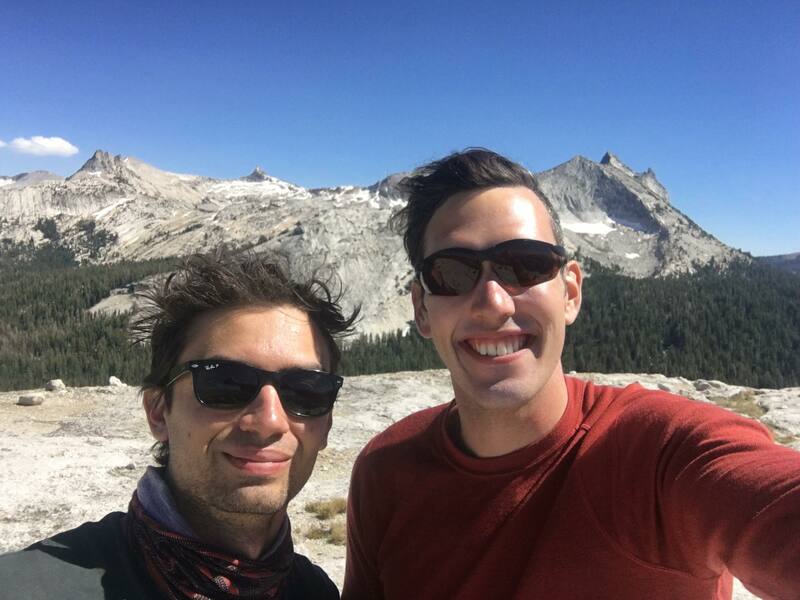 My more experienced climbing friend of mine was more than happy to head off to Yosemite to climb these five star classics. A five hour drive with stop to provision at the last good grocery store in Oakdale and we were in the park. Luck was also on our side Friday when we arrived to the full first come first serve campground of Porcupine Flat around 7pm and snagged a campsite that was paid for, but was empty including the bear box. Another unexpected treat was sharing this campsite with two girls from San Francisco who had day hiked Half Dome and were backpacking around the area. A friendship around dinner and a nightly fire that grew out of sharing the essentials: water, spicy carrots, candy bars, beer and wood. 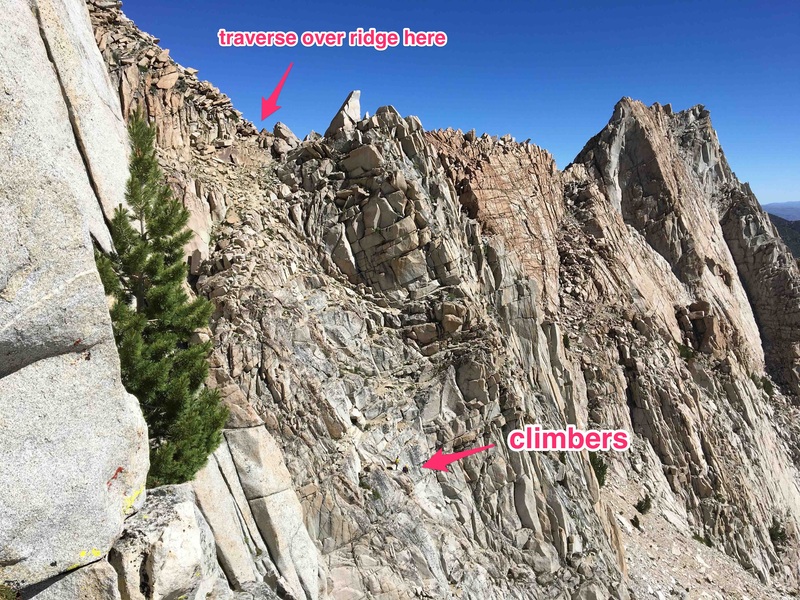 Finally, all our beta on these routes were from the Super Topo Tuolumne Free Climbs book. Fairview Dome with follower climbing the first pitch and one party waiting. 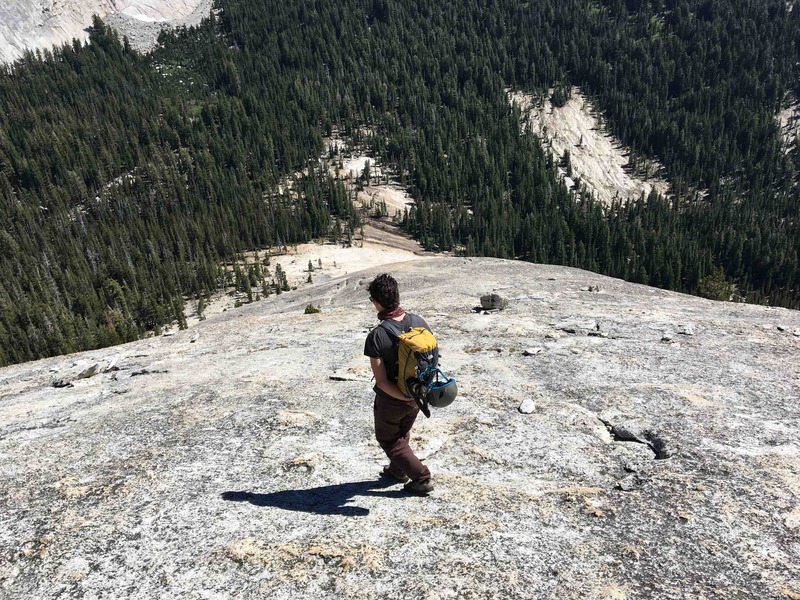 Fairview Dome is a 12 pitch, 900′ climb offering panorama views of Yosemite and fairly easy trad climbing making it a very popular route. For this reason we decided to start early, driving out of camp at around 6am. My experience was that climbers are pretty relaxed and start much later in the day so I thought we would be first on the route. However, when we arrived at the base of the climb at 6:50am a leader was already on the wall with a party behind it. I didn’t expect to wait for two hours until we started our first pitch at 8:50am. This type of wait appears to be fairly regular since we passed the Fairview Dome parking lot the next morning at 6am to see already two cars parked there. The first pitch was a little wet in the crack which was of mention for some of the climbers, but didn’t cause me any challenge. 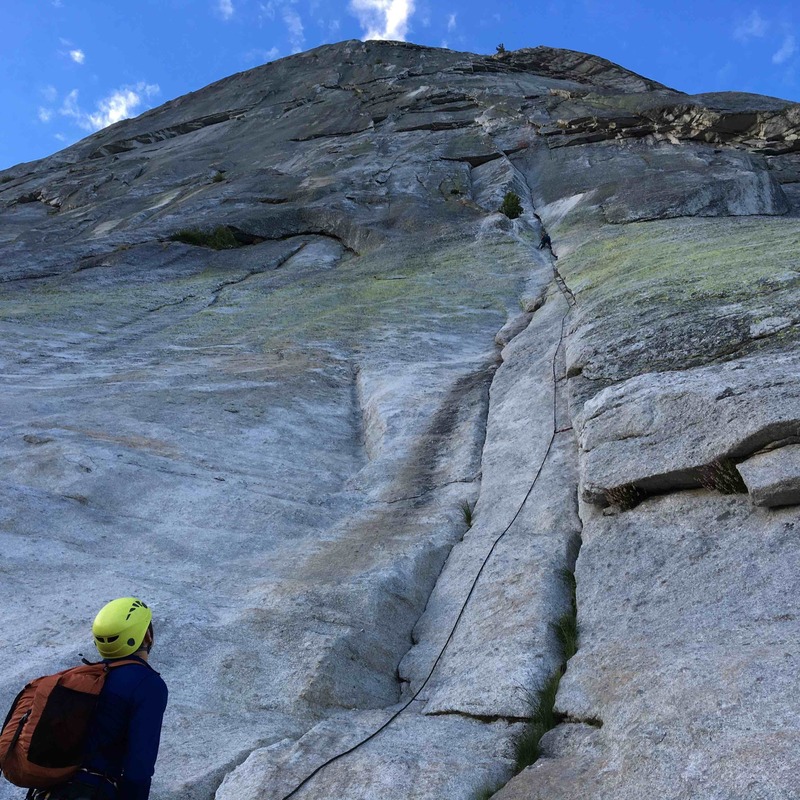 My climbing partner led the first three pitches since this was my first Yosemite climb, linking pitch two and three with our 70m rope. I then led the next five pitches and the last four of simul-climbing. They mean it when they say many slings. Often I would use 4-5 slings for extension of cams and possibly extend some alpines on some nuts. Some beta: After you get on Crescent Ledge there is opportunity to pass parties, but not much before. I would recommend going to the right of the flake on pitch three since going left added a lot of friction. Also, I got a little to the left of the roof leading pitch five which was definitely more difficult. Finding the route further on the right I was overjoyed to discover a piton protecting the roof move after expending a lot of energy leftwards. We reached the top of Fairview Dome at 3:30pm, six and a half hours after starting. The view was fantastic, the sun that had been on us all day was still strong and I was happy to remove my climbing shoes. This was my first trad multi-pitch lead and I found it to be incredibly rewarding and fun. I’m relatively new to crack climbing, but I was able to get really solid jams and feel confident with my Ocun gloves. After some water, snack and a quick phone call to check on U.S. Visa status we were walking off Fairview Dome which of itself is also pretty cool. Back at the car after about an hour decent and then hammock lounging the rest of the day. Exhausted from the 900′ climb and the continuous sun we got. Face of the Third Pillar of Dana from the North near the start of the route. 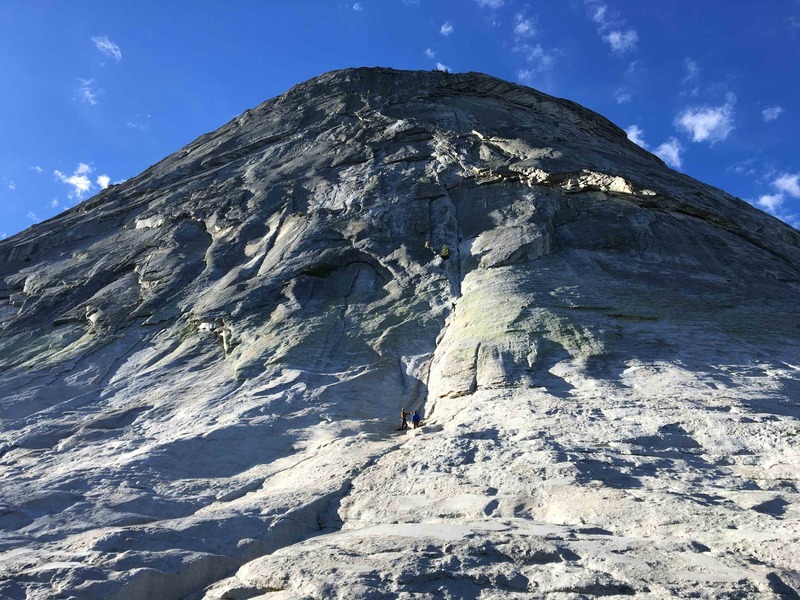 The Third Pillar of Dana is a beautiful five star pillar reaching 11,400′ featuring a fantastic 600′ 5.10b route with a wonderful mix of about every technique of climbing: finger cracks, off widths, chimneys, lie back, etc. Given our experience waiting in line Saturday on Fairview Dome we decided to have another early start (6am) out to the Third Pillar which is a bit longer of a drive (just outside of Yosemite) and has a decent approach. This decision paid off since we ended up beating one party on trail that was still getting sorted at trailhead and even another party that was biovac’d near the top of the pillar. There was a third party however already started on the Direct Route below us when we started via the Regular route, but otherwise we were the first with nobody ahead of us! 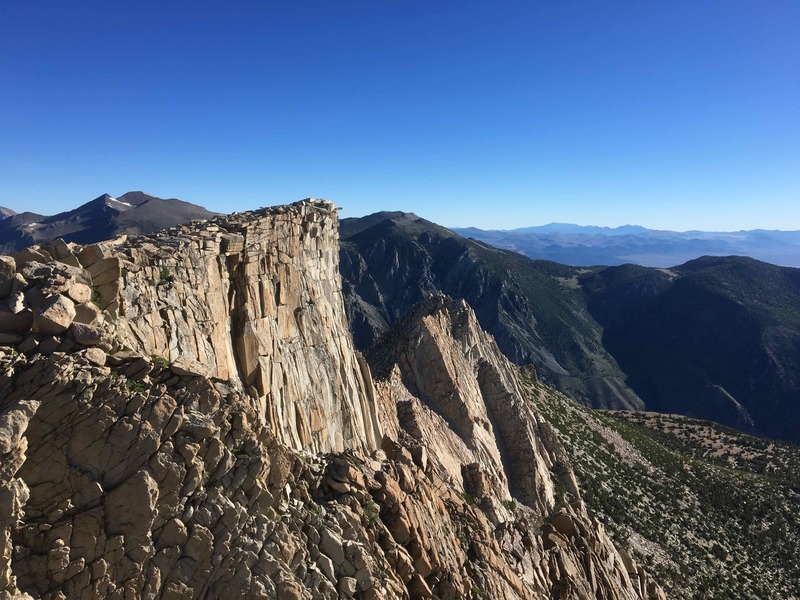 The approach to the pillar is nearly three miles with about 2000′ of elevation gain (approx. map). We started at trailhead at 6:30am and made it to the top of the pillar at 8am with a quick pace. 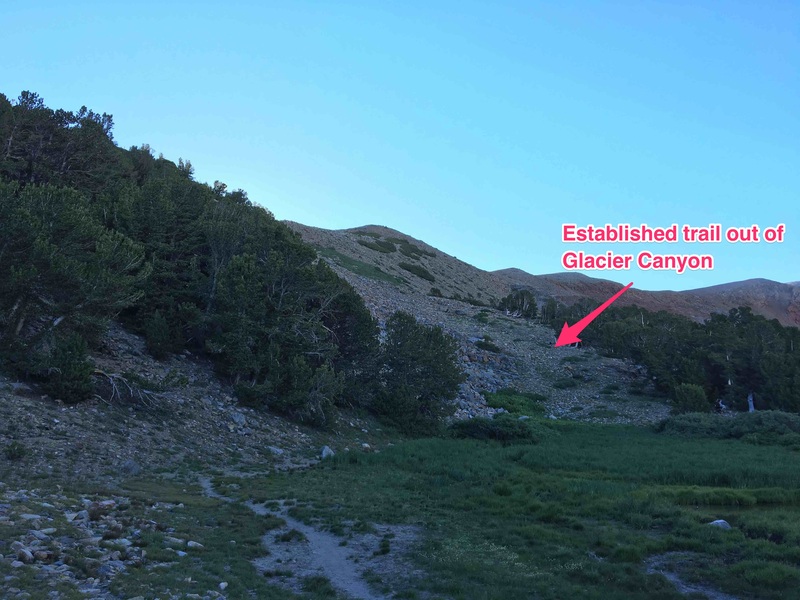 The trail was very well defined leaving Glacier Canyon up until the highest most plateau where navigation becomes easy as you just need to walk East towards the rising sun. 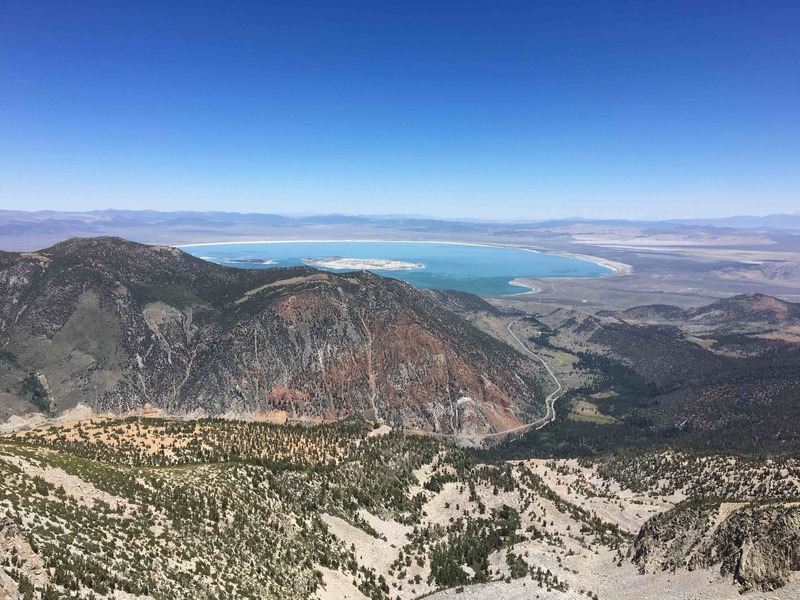 This alpine plateau (of which the pillar is a part) drops off to a continuous cliff face towards stunning views of Mono Lake. Once we located the pillar we dropped one of our bags and descended to the left of it down some steep, semi-loose rock. I love a scramble and the continuous 3rd class descent was a bomber way to get the adrenaline going and pumped for the climb. Just remember here that you mainly want to traverse not descend. Don’t go down too far. After traversing over this ridge that reaches up to the pillar you down climb to the start of the route where I took this photo. The descent probably took us a half hour, but an hour had passed between when we first saw the pillar and starting climbing at 9am due to route finding, racking up, etc. I led a very fun and solid first pitch and then my partner led the rest of the route. My climbing shoes were still stretching out and my feet were killing me from yesterday still. The pain making me not want to toe jam the awkward 10a finger crack on pitch two made it a difficult segment for me. However, pitches three and four were incredibly fun with great flow and variation. 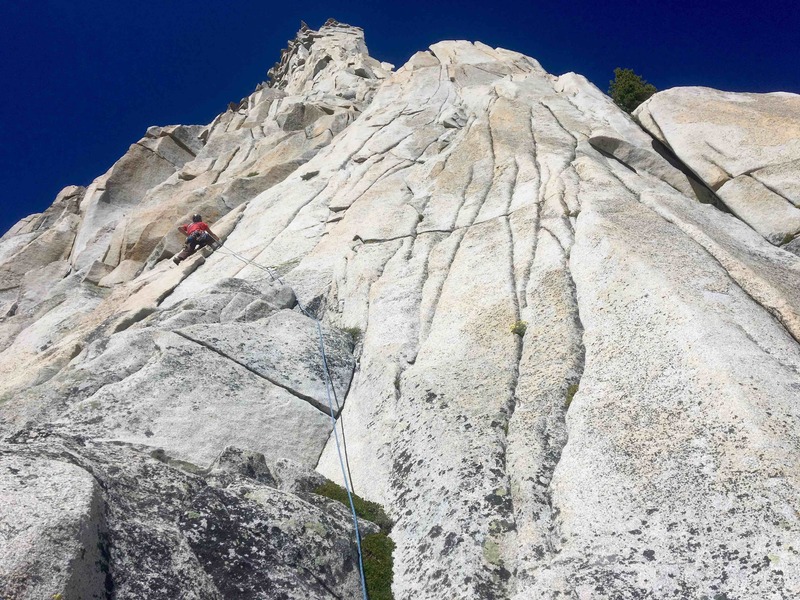 Bypassing the 10a finger crack on pitch four for the 5.8 faired squeeze chimney against the flake was super cool. Finally, pitch five had two really interesting 10b finger cracks which were very rewarding, but the first near the roof gave me some worry while setting position up for the move. 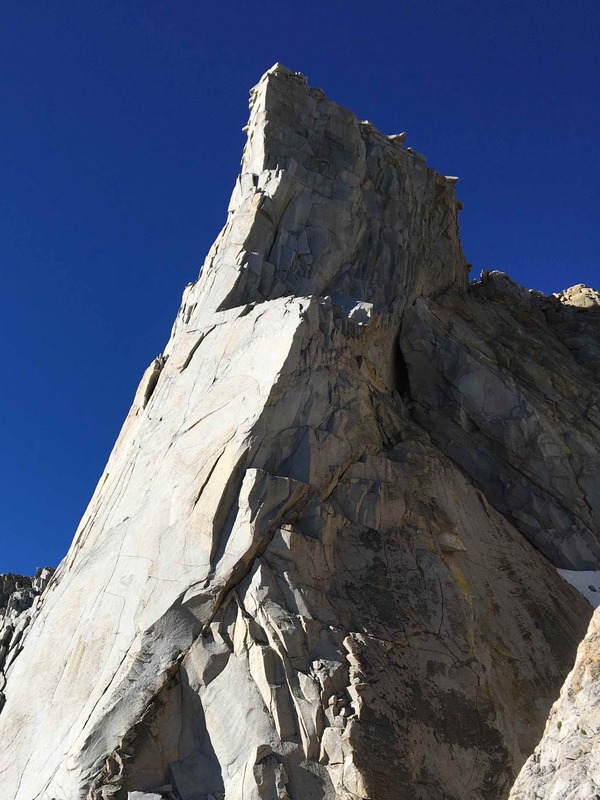 Super Topo calls this last pitch the ‘most dramatic and highest quality single pitch of the High Sierra’. My climbing parter leading pitch two. Photo from belay. We topped out on the pillar at 2pm after a 5 hour climb, now five parties climbing behind us. Overall the climb was spectacular. The setting, flow, diversity and beauty of the pillar just made it such a rewarding climb even with the intense foot pain. I would totally come back and do it again. One last thing of note was that it was incredibly windy and cool at the top of the pillar, but the East face was very calm and warm in sun. Overall an amazing weekend in Yosemite. Huge thanks to Michele my climbing partner for leading so many pitches!